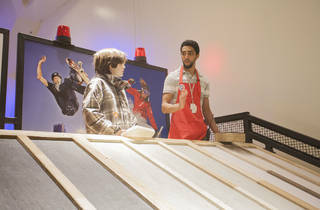 In conjunction with their new "Tony Hawk: Rad Science" exhibition, which explores the physics of skateboarding, the New York Hall of Science is offering a series of related workshops. Today, local skateboard legend Rodney Torres will demonstrate some skateboarding tricks showcased in the exhibition. Ages 5 and up.